Melissa Curry commenced working for Fresh & Clean (Meadowbrook QLD) over 10 year ago and in that time she has worked in numerous positions including wash bay, service support and First Aid. Today Melissa carries out the important role of servicing Alsco’s First Aid customers with their requirements. Melissa’s day starts at 5.30 each morning as she heads to her first customer to service their units. She arrives back at the depot at around 1.30 pm after refilling her vehicle in preparation for the following day’s work. On arrival at her customers’ premises they are greeted by a fresh face and warm hello as Melissa proceeds to replenish their First Aid units and other first aid requirements including defibrillators and eyewash stations. Throughout the day Melissa keeps in close contact with her supervisor, Debbie Blake, to advise of any additional matters or changes that may need to be actioned as a matter of priority. In chatting with Melissa she acknowledges that one of the most rewarding things about her job is that she believes the service she provides to her customers could actually save a life, by ensuring that each first aid unit is compliant with the requirements of that specific customer as well as with WHS requirements. On a daily basis Melissa will service anything from 25 to 40 units depending on the area and clients she has been allocated. One of the most enjoyable parts of her day is meeting people, and she has one of the most impressive business card collections you will ever see! For all new customers Melissa puts their business card in her folder so that on the next visit she is able to acknowledge and personalise her greeting with them by name. Melissa believes that she has the best job in the company. There are occasionally some challenges which include the grumpy customer, finding new customer locations and the ever increasing demand for OHS inductions. Although Melissa was born in South Australia most of her family are either in Queensland (where she lives) or Western Australia. Her trips to WA are not as frequent as she would like but when she goes she takes full advantage of being with her family. Melissa is a passionate angler and with her husband they try to get away on weekends to catch that elusive big one. To date, she says the biggest catch she has been a metre in length. However, we all know what fisherman are like when it comes to describing how big their catches have been! Finally, when asking Melissa about her future she says that she loves doing what she does and cannot see herself doing anything else. After my day our with her I am grateful to have such a dedicated and passionate team member working for our company. I know our customers will always get the service they expect when Melissa visits. 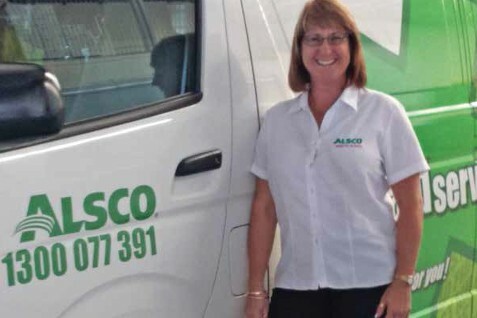 So if you would like to be Melissa Curry or her equally passionate colleagues to service your first aid requirements, get in touch with Alsco here.